The city of Tabriz in Iran sits in the northwest part of the country, near the border with Turkey. It is a major center of commerce because of its location. Tabriz is also well known for the fine Persian rugs that are made in the area. The city is known around the world for its Persian rugs and has played a major role in the development of the decorative arts in Iran. An antique silk Tabriz Persian rug. Tabriz has a rich history of rug making. It is one of the oldest rug making centers in the country and has one of the greatest variety of rugs. The rug designs range from medallion, Herati, figural, and pictorial. A variety of carpets come from Tabriz, ranging from pile carpets to a flat weave. The craft of carpet making was passed on through generations, and this skill was considered the most valuable thing a family could have. 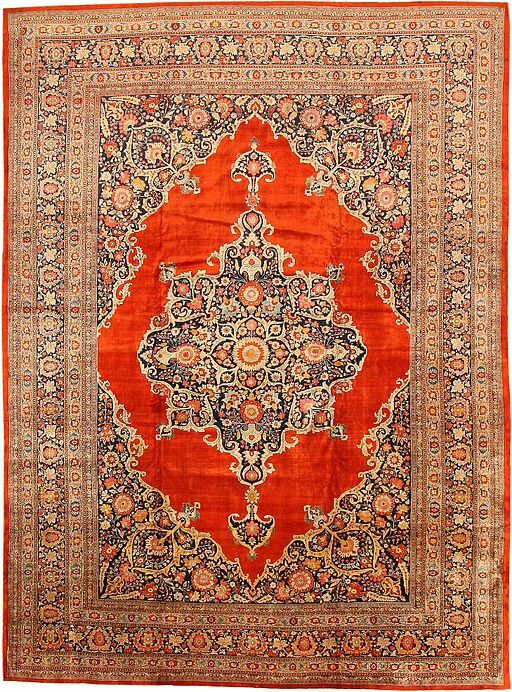 Traditionally, Tabriz rugs focused on ornamental patterns with cream, red or navy blue background colors. The designs for the Tabriz rugs are often taken from the writings of the great Oriental poets. They often show scenes of falconry or images of a menacing lion. Tabriz rugs are also noted for images of palaces, mosques and battle scenes. Other scenes have been inspired by the covers of ancient books. The rug making tradition in the city was at a high point in the period from the 12th to the 16th centuries. Later, during the 19th century, the city of Tabriz was home to some of the most celebrated rug weaving artisans, who carried on the tradition begun there hundreds of years earlier. Artisans in the city led the way in a renaissance of rug making, rugs that were made for the people of Iran as well as for export. Their craftsmanship was unparalleled, and the materials they used were of the highest quality. Tabriz weavers made rugs with tightly-packed knots and complex floral designs. Some of the rugs produced there in the 20th century are among the finest ever made. Tabriz rugs are unique because they have a double weft, most often made from cotton or wool, along with cotton warps. They also use both Persian and Turkish knots and a tightly woven double foundation. If you’d like to look at some Tabriz hand-knotted rugs yourself, visit the Behnam Rugs showroom in Dallas. Give us a call at 972-733-0400 to make an appointment.